PHILOLOGOS in The Forward: Cracking the Ugaritic Code: Hebrew and Sister Tongue Grew From Ancient Semitic Language. The treatment is pretty accurate, but a few comments are in order. First, it is not quite true that the Ugaritic alphabet does not indicate vowels at all. The letter Aleph comes in three forms, each of which attaches a different vowel to the consonant (a, i, or u). Second, it is not clear to me that Yamm or Sea is the same being as Lotan/Leviathan. Yamm is the god of the sea, whereas Leviathan is a sea monster. Third, it should be noted that the Ugaritic phrase quoted in the article appears in Hebrew in almost the same consonantal form in Isaiah 27:1. Finally, Ugaritic does "predate" Hebrew in the sense that it is older than the Hebrew we have in the Hebrew Bible, which (possibly with a rare earlier exception here or there) dates to the Iron Age II (c. 1000-586/7 BCE) and later. But Philologos is correct that Hebrew does not descend from Ugaritic; they are independent branches of Northwest Semitic. Still, whatever ancestor of Hebrew existed in the time of Ugaritic would be rather different from the Hebrew we know from the Bible and it would be a stretch to call it "Hebrew." AT THE UNIVERSITY OF WASHINGTON - SEATTLE: Call for Applications: Assistant Professor in Classical Judaism. The Henry M. Jackson School of International Studies at the University of Washington invites applications for a tenure-track assistant professorship in classical Judaism. Possible areas of specialization include rabbinics, medieval commentarial literature, medieval philosophy, Jewish mysticism or Jewish law. The ideal candidate will study the Jewish religious and textual tradition within a broader cultural and comparative context. We expect this hire to play an integral role in the Samuel and Althea Stroum Jewish Studies Program, a nationally renowned program whose mission includes community engagement, outstanding scholarship, and exploring the integration of Jewish Studies and digital technologies. In addition, the successful candidate will be expected to contribute to the Comparative Religion program and to the interdisciplinary curriculum of the Jackson School. HT Carla Sulzbach on Facebook. MARGINALIA: Ishay Rosen-Zvi on Rabbis as Romans, by Hayim Lapin: In what sense were the rabbis Roman?. In 2012 I noted the book as forthcoming here. The state now maintains that the inscription on the limestone box and the tablet are forged -- but the stones themselves are ancient and therefore belong to the state. For its part, the IAA declined to comment after several days of repeated efforts by FoxNews.com. "The IAA does not give interviews on that issue," the agency said. I think the text of the Joash Inscription (Jehoash Inscription) is a modern fake, for reasons given quite a while ago here. I have the impression that at least most philologists agree on this. More to the point, I am still unaware of any peer-review publication that has argued for the authenticity of the Joash inscription or the full text of the James Ossuary inscription (see below), although I haven't been following the discussion closely and it's possible I have missed something. I am unqualified to have any opinion on whether the stone on which the Joash inscription is written is "ancient" (presumably meaning it is an ancient human-produced artifact, since stones by nature are pretty old). The James Ossuary itself is an ancient artifact, but there is a great deal of debate on whether all or part of the inscription is a modern (or at least later than first century) forgery. Background on the Israel Forgery Trial is here with many, many links. THE ETHIOPIAN TRADITION that the Ark of the Covenant is kept in a special sanctuary in Aksum is explored by Paul Raffaele for The Smithsonian: Keepers of the Lost Ark? Christians in Ethiopia have long claimed to have the ark of the covenant. Our reporter investigated. He got to see the guardian of the Ark, but alas, not the Ark itself. This is one of a number of less than convincing claims to account for the whereabouts (or at least fate) of the Ark of the Covenant, about which PaleoJudaica has posted many times. Start here and follow the many links back. A DEAD SEA SCROLLS EXHIBITION is being run by Kossmann.dejong in Assen, the Netherlands: Kossmann.dejong: An Exhibition Takes Visitors 2000 Years Back in Time. THE BRITISH NEW TESTAMENT CONFERENCE meets here in St. Andrews starting a week from tomorrow (29-31 August). For those attending, the conference program and some travel advice have been posted on the website. Just follow the link and scroll down to "Conference Details." I wonder, however, whether the rabbis were also motivated by their general tendency to discourage Jews from mingling too much with non-Jews. In Tractate Eruvin, we saw how the rabbis strongly advised a Jew not to live on his own in a non-Jewish neighborhood, lest he end up getting murdered. In an age when the non-Jew was seldom encountered except as an enemy, the rabbis may have thought it wiser for Jews not to do any business with their non-Jewish neighbors. Happily, I learned from the Schottenstein Talmud’s notes that this ban, like many Talmudic provisions, is no longer in force; so if you have an ox to sell, feel free to put it on Craigslist. THE HEBREW UNIVERSITY now has a full archive online of the textual criticism journal Textus: Studies of the Hebrew University Bible Project. Mystery word solved in the Apostrophe to Zion? 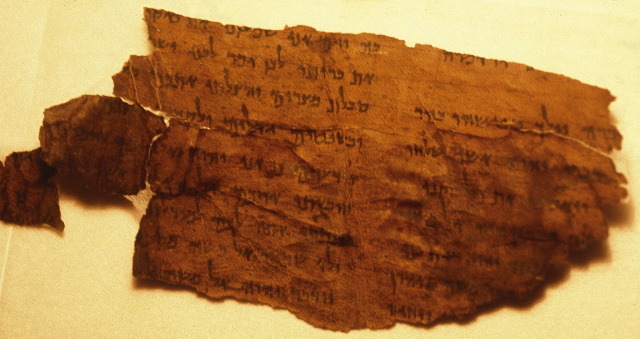 The verse with the word titbaech appears in a poem called (in English at least) “Apostrophe to Zion” — which appears in the so-called “Psalms Scroll”, together with other poems very much like the biblical Psalms. Most of the Psalms Scroll had been satisfactorily deciphered and published in distinguished scientific journals. But the mystery verse with titbaech remained obscure. There were interpretations, to be sure. They just didn’t make much sense. And then Hanan Ariel and Alexey Yuditsky, doctoral students working on a project at the Hebrew Language Academy, had an epiphany. Aha, thought the students: what if the mystery verb titbaech bore a rare meaning, not commonly known – not “seek” or “demand,” but “follow,” overtake”? It's an interesting proposal, but I have reservations about new meanings derived primarily from Arabic cognates. When you start looking for cognates for a Hebrew word in Lane's Arabic English Lexicon, you tend to find a lot of them, and with a wide range of meanings. I wouldn't bet too heavily on any one of them unless there is substantial additional supporting evidence. Perhaps there is here, but we should wait for a full peer-review publication to evaluate the argument fully. Meanwhile though, as I said, it's nice to find a user-friendly media discussion of a technical philological proposal. MARGINALIA: Eva Kiesele on Socratic Torah, by Jenny Labendz: Plato, Bakhtin, and the Rabbis meet again. Archaeological excavations conducted by the Israel Antiquities Authority in the area of the Gihon Spring in the City of David, in the Walls around Jerusalem National Park, have unearthed a layer of rich finds including thousands of broken pottery shards, clay lamps and figurines. 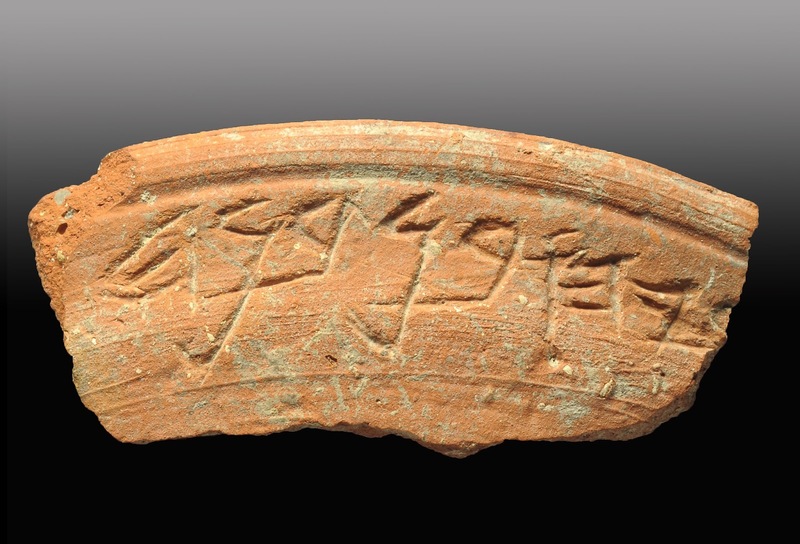 Most intriguing is the recent discovery of a ceramic bowl with a partially preserved inscription in ancient Hebrew. While not complete, the inscription presents us with the name of a seventh century BCE figure, which resembles other names known to us from both the Biblical and archaeological record (see examples below) and providing us with a connection to the people living in Jerusalem at the end of the First Temple period. This fascinating find will be presented at Megalim's Annual Archaeological Conference which will take place on Thursday, August 29th in the City of David. The first letter of the ceramic bowl’s partially preserved inscription in ancient Hebrew script is broken and is therefore difficult to read, but appears to be the letter ר. The next three letters יהו constitute the theophoric suffix (the component in which the name of the deity appears as part of the first name, such as Yirme-yahu and Eli-yahu, etc). These letters are followed by בנ (the son of) after which appears the patronymic name composed of the three letters בנה. According to archaeologists Uziel and Zanton, “If we consider the possibility that we are dealing with an unvowelized or ‘defective’ spelling of the name בניה (Benaiah), then what we have before us is the name "...ריהו בן בניה"
Photo number 1 above. Click on the image for a larger view.HT Joseph I. Lauer. REPORT: Iraqi Jewish Archives to be housed in the Iraqi National Library and Archives. HT Dorothy Lobel King. Background here and many, many links. ERIC KWAKKEL: Medieval palm reading. This image with Hebrew annotations is from the 13th century, but Jewish chiromancy (palm reading) is considerably older, and Jewish physiognomy (determining character by a person's physical characteristics) goes all the way back to the Qumran Library. See the Jewish Virtual Library article linked to in Kwakkel's post. I also discuss these matters in my article The Hekhalot Literature and Shamanism and at greater length in chapter 3 of my book Descenders to the Chariot: The People Behind the Hekhalot Literature.